I do my best to educate myself on mommy things. I read, I research, I talk to other moms, I have mentors, I even attend seminars. But sometimes a situation arrises with a child that I have no idea what to do about and no book or friend or mentor or seminar has the answer I need. In these times all I can do is pray. I had the opportunity to join a prayer group for our school this past year. This was my first time in a group like this and it was so encouraging to me. It was nice to get together with other mothers who believe in the power of prayer and have the same desires for our school and children that I do. Coming together to kneel before our King and ask for his guidance and protection together felt so much more powerful than me doing it alone. Being a part of this group also opened my eyes to what I can pray for for my kids too. 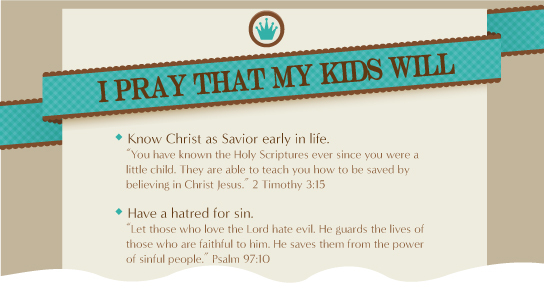 That sounds funny, but for me sometimes, I’m not sure what exactly to pray for my kids. It’s usually, “Lord, please help me. I have no idea what I am doing. Give me guidance and patience. Amen.” But I found some scriptures that gave me some much better ideas on how to pray for my kids. Oh, some really good stuff in there, right?! I created a little card out of these to keep in my Bible and by my bed. I have been thinking about it for a while, but I am finally going to start a prayer group for mothers. I am hoping it will be a place where we can share our needs, and pray for each other’s families while we watch the power of God work in our lives. If you have a burden for this too, I encourage you to do the same thing. Invite some friends over for an hour, mingle, pray, and then chat a little more. Wouldn’t it be exciting to see our families and communities transform just from us asking – together.